Over the last four years I’ve been in a casino thirteen times. Now you might ask, “How do you remember?” Well, I have this thing I’ve been doing which helps me remember. Every time I step foot in a casino I find a roulette table, reach into my wallet, pull out $100, get one $100 chip, and put it on Black. After thirteen visits to a casino in 4 years I am 0-13, I’ve lost thirteen times in a row!! That is pretty bad luck on a bet that is a little less than 50/50 odds. I think it was after the 10th loss in a row, I brought my wife with me to witness this bad luck streak. I put down $100 on black, I lost, I threw up my arms in disgust, and my wife furrowed her brow and walked away unimpressed. But that is gambling. Many view investing and especially investing in microcap stocks as gambling. 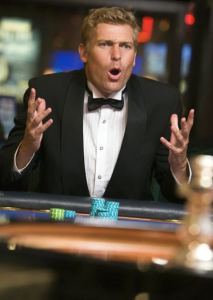 I view investing in anything but microcaps as gambling, and here is why. There is always someone on the other side of every trade you make. When you buy 1,000 shares of a company, someone is selling 1,000. In the stock market it is you against the world, especially with larger equities, smallcap and larger. You against some of the biggest, smartest, most well educated investors in the world. Some of these firms manage tens of billions of dollars and employ thousands of employees to make sure they are always smarter than you. What edge can I get in liquid, known companies, which have multiple analysts covering them? Not much. < 1% of active fund managers in these known, liquid markets, consistently beat the market over the long term. This is not a game I want to play. I might as well just go spin the roulette wheel. I enjoy playing golf, and I’m decent at it with around a 6 handicap. I can beat most of the people I play against here locally. Remember I live in Lancaster, PA (Amish Country), so there are only three other people here that play 🙂 Not for one second do I think I can compete against Rory McILroy, Tiger Woods, or any other professional golfer. If Rory and Tiger showed up at my doorstep, which they always do, wanting to play a heads up round of golf for $100,000, would I do it? Heck no, they would beat me every single time. The microcap space is one of the few places where experienced investors like me managing small amounts have a real edge, where the odds are actually stacked in our favor. The underlying dynamics that produce these constant inefficiencies and opportunities have been in place for decades and aren’t going to change anytime soon. Dynamic #1: Microcaps are illiquid. Small market caps don’t necessarily drive outsized returns. 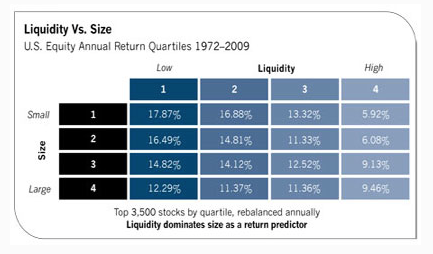 What drives outsized returns is illiquidity. It just so happens that most small market caps are illiquid. Dynamic #2: There are a lot of microcap companies. Microcaps make up 51% (11,735/22,894= 51%) of all public companies on the US and Canadian stock exchanges. Dynamic #3: The mainstream financial media’s constant attacks on microcaps and penny stocks keep investors away. This is quite comical given the fact that most investing gurus got their start in the microcap space. Warren Buffett, Peter Lynch, Joel Greenblatt and many others all started in microcaps. Berkshire Hathaway was an $18 million market cap when Buffett started buying shares. The companies he purchased like See’s Candies for $25 million in 1972 were effectively microcaps (hat tip @ejburnside). Investing gurus often go where inefficiencies are the greatest, and microcaps have historically been that place. Dynamic #4: The really good, highly experienced microcap managers, quickly and literally move on to “bigger” things. As their assets grow, they need to invest in bigger companies so that it can move their performance needle. So for me as an investor this is great because there is a constant outflow of quality “competitors” for new ideas. The cream of the crop is constantly moving up the market cap threshold. A microcap investor friend of mine started a fund two years ago and now it’s up to $70 million. He told me this week that he just can’t look at anything under $50 million market cap anymore. Sounds good to me! Dynamic #5: Bigger “smarter” money can only buy microcaps when they are higher. Connected to #3, larger funds can only buy microcaps when their stock price and liquidity profiles increase. As a company executes, the stock rises, the liquidity rises, and institutions can buy. I talk about this [HERE]. Now I don’t want you to get the impression that microcap investing is easy. In many ways it is very challenging because of the human element, management, which has a far greater impact on these small companies. Management teams can do unpredictable things, but this added nuance is balanced out by a far greater reward profile in microcaps. Becoming a great microcap investor is less about being smart, and more about working harder than other investors. I can attest to this. I’m a full time investor, and although I have an MBA, I can guarantee I’m rarely the smartest person in the room, even in a room of first graders. But I know what I know, and more importantly I know what I don’t know. My experience allows me to be able to make very quick, very precise decisions when evaluating a company and its management team. Experienced individual investors and small institutions have a huge advantage when it comes to investing. That advantage is the ability to invest in microcaps, and with a little experience it’s a game you can win. Wow, that was well said. And the crazy thing is that millions of small time investors pool their money together into a $10 billion mutual fund that can only buy the always over-priced S&P 500 stocks. And pay 1% of assets to further guarantee long-term under perfomance. @ 5:00am you can tap into your innate and express universal truth. Keep them coming! Thanks. The interesting thing is all five dynamics I listed are reasons why most investors stay away from micro caps, and yet those are the reasons their are opportunities. Definitely can’t think the way the world thinks. Ian, very good summary. This should be a rule of thumb. Little money is likely to continue to be a huge structural advantage over large amounts of money since humans are unlikely to change. Wall Street will continue to develop products to sell to the masses who could otherwise invest in these tiny companies; investors are impatient and scared of short term volatility so illiquidity will always be a turn off; and good fund managers will more often than not graduate to the next level in search of more profits. That leaves this side of the market almost perpetually inefficient. The book Small Cap Advantage goes into all the dynamics you pointed out in greater detail. Thanks Sean, I’ll have to check that one out. it’s good to see the Canadian marketplace start to wake up to the fact that their are great non resource micro caps that exist up in Canada. BioSyent and many others are forcing them to pay attention. I 100% agree with your thoughts on investing in micro caps. Great article! Fantastic write up. Very specific points. I liked your description of how the big companies started somewhere and that is small. Read the post 3 times that’s how much I enjoyed it and shared it with my investment club. Fellow micro cap investors. Solid article. Love the golf illustration/comparison, it really drives home the point. Thanks! Great article. Focusing on Microcap’s has really given me an edge in two areas, which I think have benefited me as an investor. 1. I don’t waste time anymore on what the Dow or S&P is doing since none of my holdings are even remotely close to them. This has freed me mentally from consistently worrying about factors I have no control over. 2. Illiquidity forces me to have conviction in my holdings, essentially treating it like I should, which is an underlying business and not a stock price. your name in a company Post. It took about 11 months to really get the feel -instinct. cut my losses when wrong and move on. The wishing and holding on, slowly became a thing of the past. I appreciate your knowledge and the time you spend to help those with courage.